Not quite fineprint, but sure feels like it! 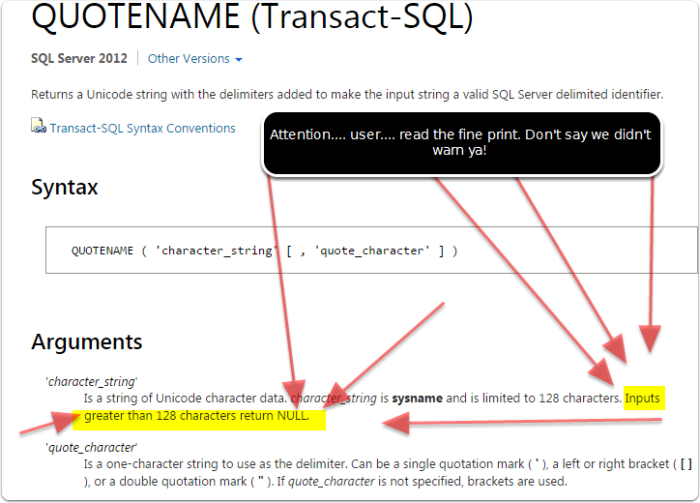 Quotename can be a pretty cool function to simplify your dynamic sql, as it can ease some of the escaping of strings. However, I normally use it for table/column names, and so hadn’t ran into a “gotcha” of this function until today. It’s limited to 128 characters, and if you pass in greater than 128 characters will yield a null. Yep… you could be trying to track down that error for a null string somewhere in your concatenation for a while… only to find out this silent error is occurring. I’d like to thank NoSqlSolution for mentioning this and helping me go back to the other window I had open and rereading it…. I guess sometimes it pays to read the darn BOL.